Physical description: Wild dogs have a canine body shape like a wolf's, but they have larger, bat like ears and white tipped tails. They have splotches of black, yellow, white, and dark brown, with no two dogs marked exactly the same. 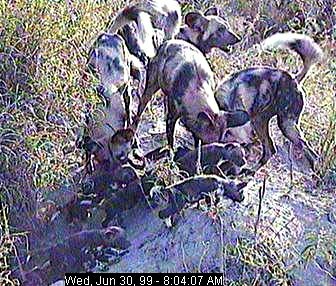 General information: Wild dogs have a highly developed social structure. They live in packs that vary from 10 to 15 animals, including males, females, and young. Their packs are nomadic, and they roam across a range of 1 to 30 miles a day. Members of the pack cooperate when hunting and raising their young. Normally, only the highest ranking male and female breed. However, other pack members help protect and raise the pups. Wild dogs greet one another through vocalizations, body posture, and licking. They have a ritualized midday greeting ceremony of squeaking and thrusting their muzzles into one anther's faces. Wild dogs are vulnerable to the diseases of domestic dogs from nearby human communities. They are also threatened by ranchers and trophy hunters. Special anatomical, physiological or behavioral adaptations: Wild dogs have developed incredible speed and endurance for attacking prey. They have been clocked at running 37 miles per hour for distances over 3 miles. They also have specialized, large, bat like ears that allow for excellent auditory ability used for hunting and ritual ceremonies. 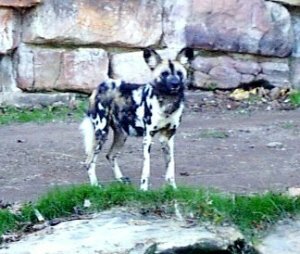 Comments about the wild dogs of the Fort Worth Zoo: The African Wild Dogs tended to sleep during the day. This is because they are adapted to hunting at night. In the zoo, the wild dogs are part of a Species Survival Plan, which coordinates captive breeding. 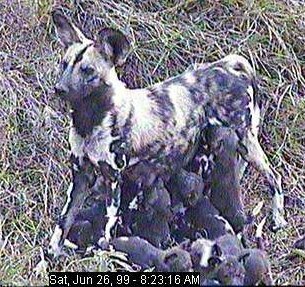 Personal Observations: The survival of African Wild Dogs is threatened by a reduction of prey abundance, disease, and loss of genetic variability. Only 7,000 are believed to exist in the wild. The wild dog has been on the endangered species list since 1984. There are numerous active groups involved in saving the African Wild Dog species. 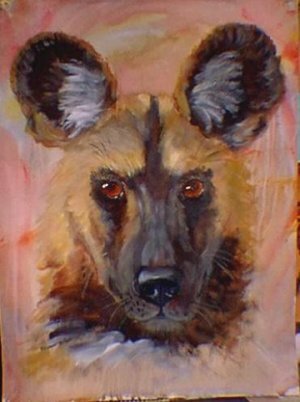 "African Wild Dog." 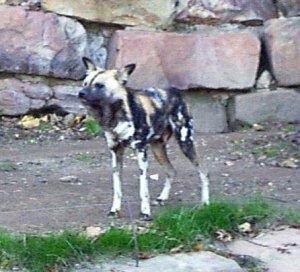 <http://www.sfzoo.com/map.dogs.african.html> (11 Nov. 1998). Borner, V. et al. "Molecular Genetic and Morphological Analyses of the African Wild Dog." Journal of Heredity, Nov./Dec., 1993, p. 450-459.